Like The Little Mermaid, this is Disney's take on a Hans Christian Andersen fairy tale. 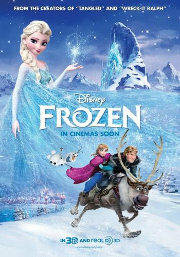 A fearless and optimistic young woman sets off on an epic journey, teaming up with a rugged mountain man and his loyal reindeer, to find her sister, whose icy powers have trapped the kingdom of Arendelle in eternal winter. Encountering Everest-like conditions, mystical trolls and an hilarious snowman, they battle the elements in a race to save the kingdom. This film is releasing in both 2D and 3D, this is the 3D version. Adventure, Animated, Comedy, Family, Fantasy, Musical. You're not a mermaid, are you?